Early evidence suggests that the Catholic Church in Libya may fare no worse under a new rebel-led regime than it did under the dictatorship of Colonel Moammar Gadhafi. “The future is very uncertain but the signs from the parts of the country that have been under rebel control since March is that Catholic priests and nuns are still being allowed to go about their business as usual. So we hope that’s a good sign for the future,” a senior local Church source, who wished to remain anonymous for security reasons, told CNA August 25. 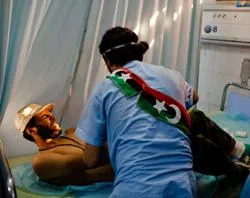 The comments come as NATO-backed Libyan rebels tighten their hold over the capital city of Tripoli and are pushing on toward Colonel Gadhafi's hometown of Sirte which is still under loyalist control. Although he is a Muslim, Gadhafi’s 42-year dictatorship saw the Catholic Church largely unhindered in its work in parishes and hospitals. In contrast, fears have recently been voiced that significant elements in the rebel forces may have an Islamist agenda. In recent days, there has also been concern for the safety of a Franciscan community based in Tripoli’s sole Catholic Church. “I’ve actually just spoken to the Franciscan priests who are in Tripoli,” said the CNA source. The Church source added that there are only three Franciscans in Tripoli at present because another three members of the community are currently unable to enter the country. The three Franciscans are trying to enter Libya from Tunisia, but the broken transportation system and blocked roads have made it impossible. One of the clergymen is a priest who had traveled to World Youth Day in Madrid. The estimated Catholic population of Libya is approximately 100,000 - most of whom are immigrants - but that number may have declined since the outbreak of trouble in February. In total, there are around 25 Catholic priests working in the country. They are mainly based in Tripoli in the west and the city of Benghazi in the east. There are also around 60 nuns who work in the country’s hospital system. The CNA source says that although Catholics only make up a small percentage of Libya’s six million population, the work of the Church’s priests and nuns is greatly appreciated by ordinary Libyans who are overwhelmingly Muslim.